Hiring an experienced commercial roofing contractor to install a flat roof on your Long Island building is essential to the roof's longevity and durability. 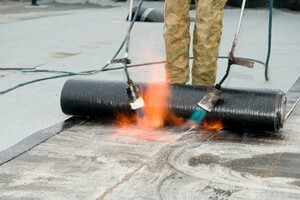 Along with proper installation, flat roofing should be maintained regularly. Even with attentive care, a flat roof will begin to deteriorate as it ages. Flat roofs are designed with very slight slopes, and these slopes are needed for drainage. Flat roofs are popular with business owners because they're easy to install and energy-efficient. If a flat roof is attached to your commercial property, you should watch out for common flat roofing problems so that you can contact commercial roofing professionals when you require roof repairs. Rain, snow, and ice accumulation on a flat roof causes complications because the slope's drainage abilities are deficient. Pools of water result in roof leaks and water damage, so if you notice ponding on your flat roof, contact a commercial roofing contractor to address the problem. As asphalt ages, it loses its elasticity and starts cracking and bubbling, a process called “alligatoring.” Alligatoring is a sure sign that your roof needs to be replaced. Leaves, branches, and other debris collect very easily on flat roofs because of their minimal slopes. The accumulation of debris is a problem because it blocks drainage and retains moisture. Buildings shift and settle naturally, and when they do, the membranes of flat roofs will begin to buckle. Extensive buckling signals that the building requires a roof replacement. One of the most common roof complications, leaks can develop as a result of buckling, ponding, improper installation, aging, harsh weather, alligatoring, or damaged flashing. The slight slope of flat roofing allows water to accumulate more than on other types of roofing, so when a flat roof isn't draining water sufficiently, the excess moisture can create an opportunity for mold and mildew to grow. If the flat roofing of your Long Island building shows signs of damage, hire a reputable commercial roofing company like H. Klein & Sons, Inc. to repair or replace your flat roof. If you are looking for a professional flat roof repair or replacement in Long Island, give us a call today at 516-746-0163 or complete our online request form today!